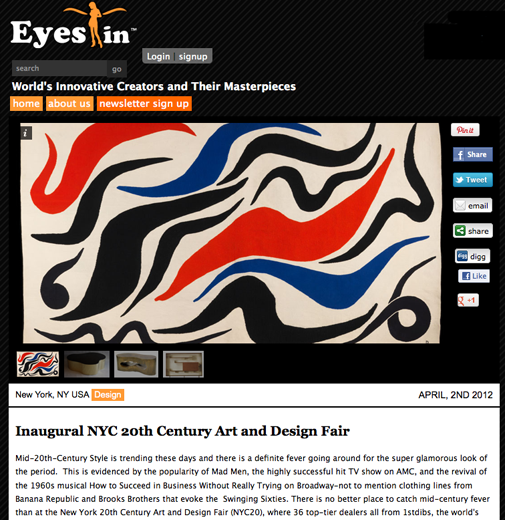 Announcing the inaugural NYC 20th Century Art and Design Fair, Eyes In Magazine featured Vojtech Blau’s Alexander Calder tapestry, “Le Lezard et le Tetard,” a superb example of the artist’s mastery of tapestry from the early 1970’s. This tapestry is a one of the most graphic designs by the artist woven at Ateliers Pinton in Aubusson, France. High End Weekly, Art Fix Daily and Design Notes each picked this tapestry as a prime example of Mid-Century style for the savvy collector. Click Here to see more.